As the hardworking staff has diligently chronicled, the New York Times is turning itself into a full-service, well, service. Travel agency, tchotchke shop, conference center – you name it, the Times will do it. Now comes the Grey Lady’s latest money-making scheme: The Corner Office Master Class, touted in this full-page ad in Wednesday’s Times. 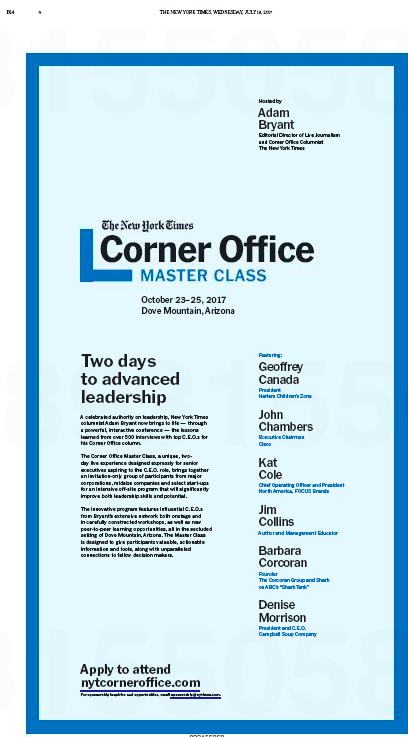 Hosting the master class is Times reporter Adam Bryant, “a celebrated authority on leadership,” who writes a column called, yes, Corner Office. As our kissin’ cousins at Sneak Adtack recently noted, the Times is “increasingly blurring the line between advertising and editorial” in its efforts to offset knee-buckling declines in print ad revenues. We totally get the need for newspaper organizations to find new sources of revenue. But there’s a fine line between selling Times coffee mugs and selling access to Times journalists. Here’s hoping the Grey Lady doesn’t cross it. This entry was posted in Uncategorized and tagged Adam Bryant, Columbia Journalism Review, Corner Office, Corner Office Master Class, Grey Lady, Jeff Gerth, New York Times, Sneak ADtack, Times Journeys, Times Store. Bookmark the permalink. Selling access to journalists is bad enough. Promising “significant improvement in leadership skills and potential” after a two-day workshop sounds like a come-on from Trump University. Publisher Arthur Sulzberger, Jr. and Executive Editor Dean Baquet. Who knows, Mudge – if that has revenue potential, they might yet do it. “fine line” or “bright line” ?